Belief, Hope & "A Reservation?" There are precious few days until Christmas. My girls are doing everything they can to tilt the scales of Polar Justice their way, and away from the naughty list. Is it too late? Time will tell. At 10 and 13 the bigger question is, “Are they, believers?” I knew they are no longer “Belieber’s” They gave up on him years ago. But, as a 47-year-old believer in the big red elf, I am crossing my fingers. Yes, there are doubters. 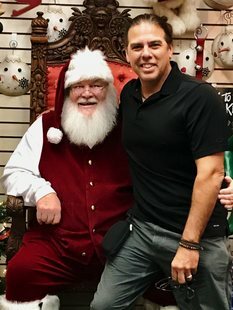 Those that will ask, “does this Santa character “really” exist? Some jolly old elf surrounded by smaller elves building toys in a workshop covered in snow?” I see no need to debate it. This past summer, I visited the North Pole. Met with the man himself. I even hung out with his reindeer. Then I sat on his lap and posed for a picture to send to my family back home. Yep, he’s real. Some might say that I visited a tourist trap. Were they to have gone there that might have been the case for them. But, for me, it was more than that. I believe, Christmas, regardless of your religious beliefs is about hope. That is why I visited the North Pole, to raise my spirits. More on that in a moment. The town of the North Pole dedicates itself to the spirit of Christmas. Their McDonald’s sign even resembles a giant candy cane. Down the road, located at 320 N. Santa Claus Lane, North Pole, AK 99705, sits one of what is rumored to be only 12 remaining Blockbuster stores in the country. Talk about hope! I am not a Griswold Christmas kind of guy. I do not run around evangelizing the holidays. I do my best to lay low and survive them. But, I miss the feeling that Christmas used to bring when I was a kid. Getting butterflies in the stomach and having wonder. As an adult, I try to hide my Grinch-like tendencies from my kids. The results are mixed. Anyone who knows me can confirm that I am a terrible gift giver. I can plan and execute on unique and sometimes even magical experiences. But, ask me to find something to stuff in a stocking, or wrap and put under the tree? Fuhgeddaboudit! The anxiety of gift giving can paralyze me. My parents divorced around the time I turned 14. Until then Christmas was great. Filled with surprises and great gifts. But, from that point forward, the holidays became more about logistics than celebration. Who to visit? When? And for how long? Something else occurred around that time. I had never seen, “It’s a Wonderful Life.” It always came on TV late at night. The first few time I tried to watch it I fell asleep. Right about the time, that George Bailey is about to jump off the bridge. Ugh! It took approximately three years before I knew the movie had a happy ending. I wanted to love Christmas. But, the joy was gone for me, mostly. Benjamin Franklin said, “If you lie down with dogs, you get up with fleas.” This year I am prepared to lay down with some new dogs. To avoid feelings and others that subscribe to the usual Bah Humbug! I began my venture by binge-watching Hallmark Christmas movies. The more predictable and sappier, the better. I decided that my fleas would be in the form of smiles and tears of hopeful joy. But, it wasn’t enough. I couldn’t watch movies every waking hour of the day. I began looking for more real-world examples of hope. That is when I discovered a story about General Electric (GE) in Schenectady, NY. In 1971, its campus received a dedicated zip code. The town already had the postal codes 12301–12309 & 12325. When GE built its 639-acre facility, it was so large, that it warranted its own. They successfully acquired, 12345! What does a massive power company have to do with Santa? Well, there is a theory that children believe Santa’s zip code is 12345. Of Course, any Kringle-Scholar, or reader of this post, knows that the North Pole’s real zip code is, 99705. We can forgive children for their lack of knowledge. In this case, their errors were rewarded. In 1994, Darlene Muscanell, a GE employee, found herself in the role of head-elf. Alongside several other GE Employees, Darlene and her fellow honorary elves, have been forgoing their lunch hours and breaks to read and respond to over 1,000 notes to Santa every year. Most senders receive primarily one of three, form-letter responses. Occasionally, a letter moves an elf-reader so much that they feel compelled to respond with a more personal touch. The GE employees inspired me. I loved reading about how their actions embodied the spirit of the season. Like the Grinch, I could feel my heart growing. Three sizes? I couldn’t say for sure. But, it gave me hope that I could take on Christmas. Less in survival mode, and more open to the joy of the season. That was, until the family and I headed out for our yearly visit to Santa. This time of year, Santa is very busy. Because of that, he relies on many helper elves to take his place around the world. To make things even easier the elves have set up a reservation system for visits. Thanks to this system, gone are the days of waiting in line for hours. Now you show up at your appointed time. Snap a picture alongside the big guy. Hand him your list and your off! Or, so the elves would have you believe. On the night of our visit, every creature was stirring. At least every cat and dog in town. The local mall elves organized “Pet Night with Santa” on the same night that we were scheduled to visit. They were also accepting walk-ins. Rather than honor the reservations they merely let everyone line up in some form of awkward chaos. We were finally granted an audience with Doppelganger Santa, 90 minutes after our appointed time. My wife made it clear that I was NOT to do my Jerry Seinfeld impersonation. The one from the Rental Car episode/The Alternate Side. I had been practicing it for 90 minutes, so I was disappointed. But, I stood down. As for Santa’s helper? He too was overwhelmed by the chaos but did a fantastic job. He commended our girls for their lack of electronic gift requests. Then he gave my wife and I an appreciative nod for being patient with the line. I would have preferred a conciliatory Cheesecake Factory Gift card. But, the twinkle in his eye was enough to get me over it. The smiles on my daughter’s faces as they accepted a candy cane gave me the hope I was seeking. I might just do more than survive Christmas after all.